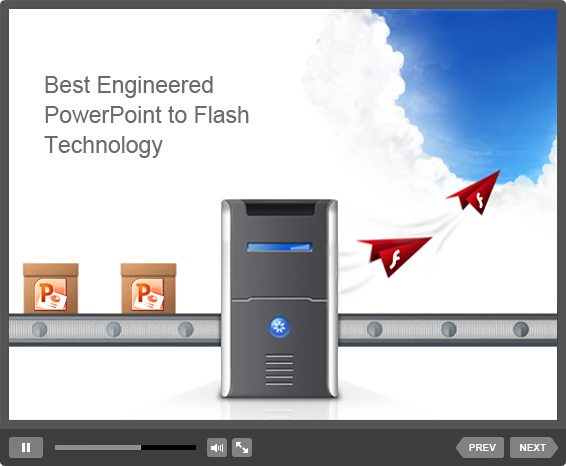 Flash presentation technology helps you create stunning web-ready content right in PowerPoint. The Flash format is specially designed for sharing interactive, rich media content on the Web. Thanks to AccuPoint technology, you can create even the most advanced Flash presentations in PowerPoint and easily view them online. Take advantage of AccuPoint technology and make your PowerPoint presentations available to millions of users worldwide! Virtually all animations – even the most complex ones – are accurately preserved in Flash. AccuPoint maintains virtually all slide transitions, including 3D effects, with precise accuracy. Interactive PowerPoint triggers are fully supported after PowerPoint to Flash conversion. Presentation's fonts and effects keep their original appearance in the Flash format. Audio files embedded into PowerPoint are perfectly supported after conversion to Flash.